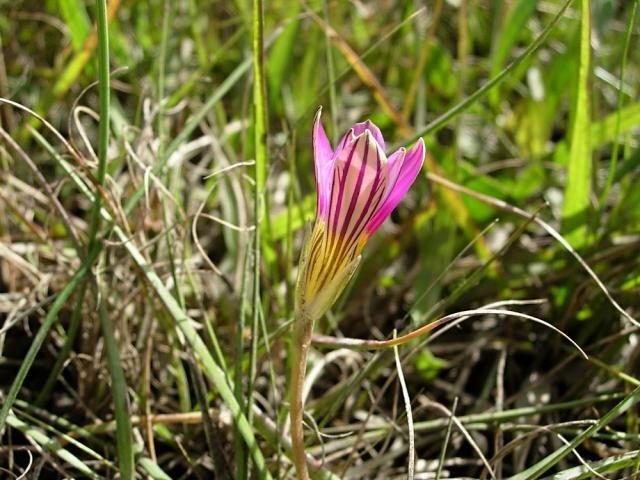 The pictures below are of romuleas that are native to South Africa, grown from seed or seen in the wild. Many of the species are very similar and difficult to tell apart. 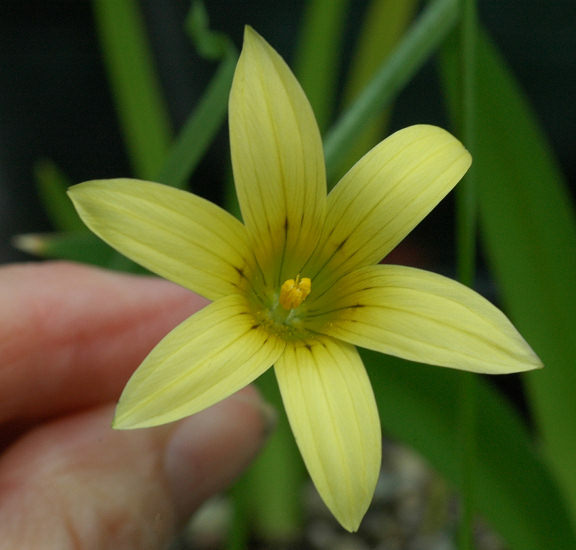 Sometimes it is necessary to examine the bracts and bracteoles and often looking at the corm is very helpful. Photos of the different corms will be added as available. 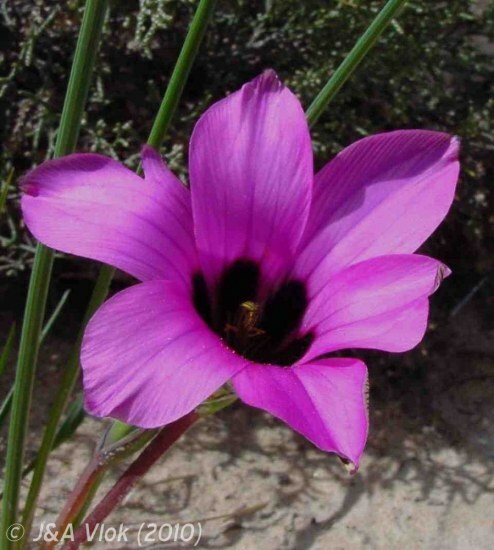 There are three good references for the southern African species, The Genus Romulea in South Africa written by Miriam de Vos in 1972, her revision written in 1982 and a later revision from John Manning and Peter Goldblatt in 2001. Species from A to D are shown on this page. 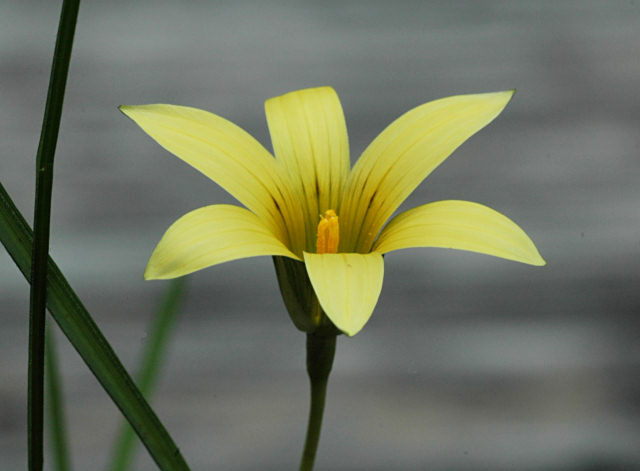 Romulea albiflora J.C.Manning & Goldblatt is a relatively new species found in a narrow area in the Roggeveld escarpment west of Middelpos. 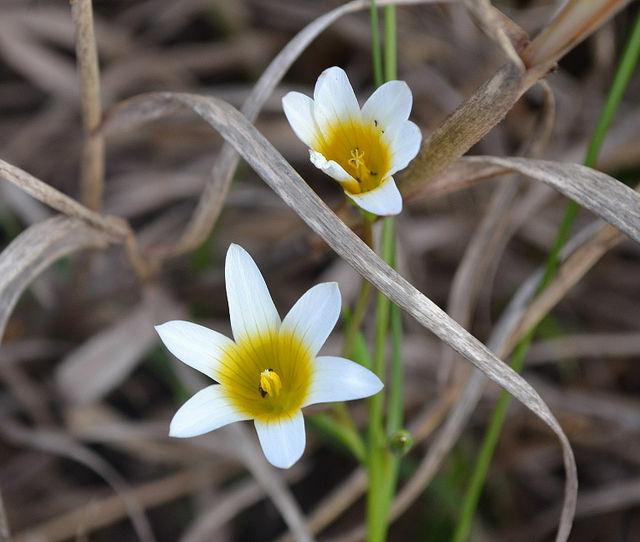 It has an asymmetric ovoid shaped corm with acuminate teeth, basal hairy leaves, and white flowers flushed mauve on the back. 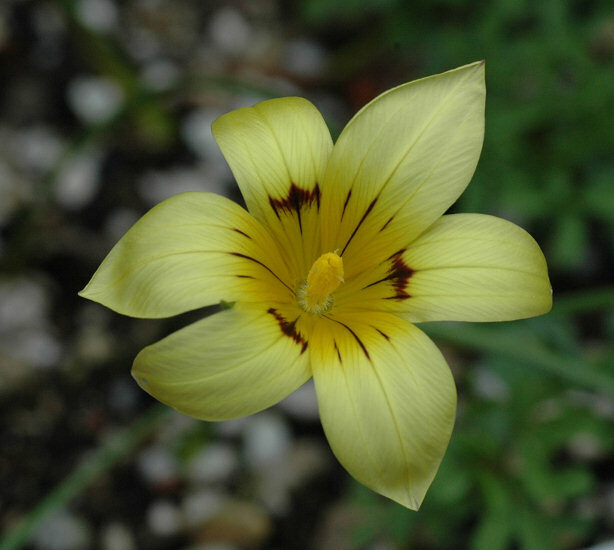 Filaments are inserted in the mouth of the tube and the anthers are purple with reddish-brown pollen. 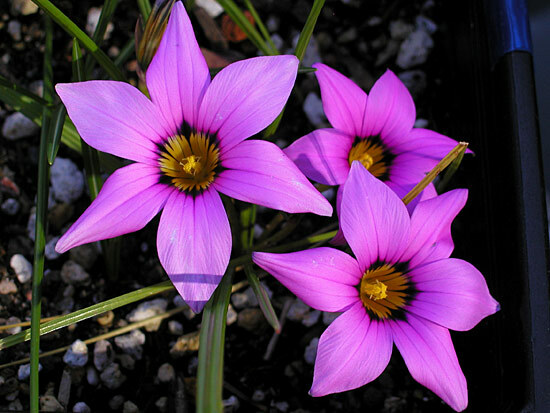 It is very similar to Romulea syringodeoflora, except that flower of that species is magenta instead of white and smaller and the leaves of R. albiflora are twice as long as the flowers. 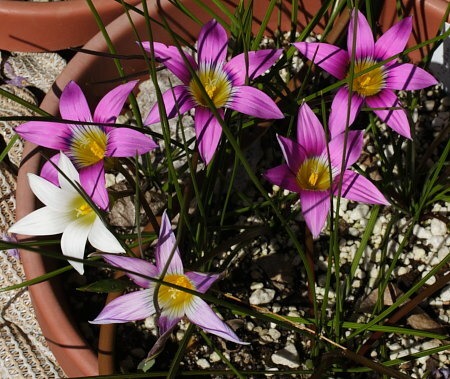 Grown from seed that was supposed to be Romulea syringodeoflora but seems to be this species instead and photographed by Mary Sue Ittner. 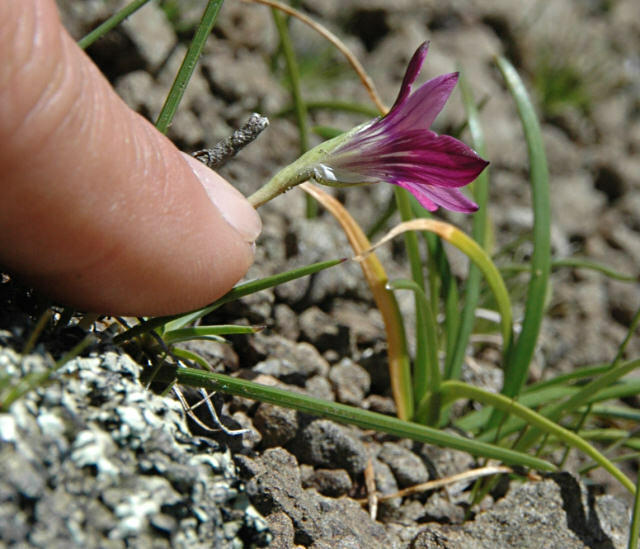 Photos show the hairy leaves and long tube, the purple anthers and the difference of the flowers in the middle of the day when they are slightly reflexed and later in the day when it is cooler and the flowers are closing. 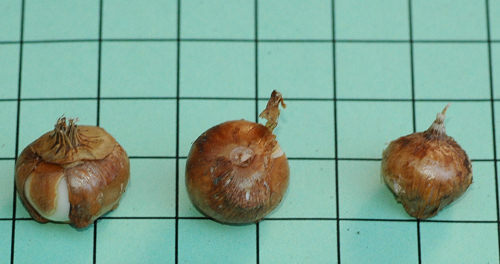 The last photo shows the corms on a 1 cm square grid. The first photo is from Rod Saunders. The last two close-ups are from Alan Horstmann. 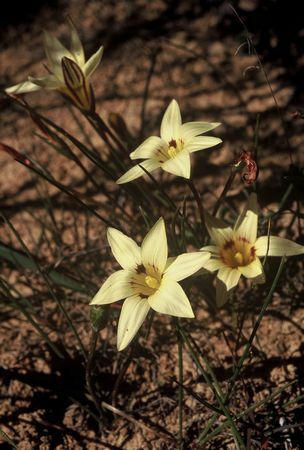 Romulea albomarginata M.P.de Vos is found on sandstone flats in the Northwest Cape, South Africa. 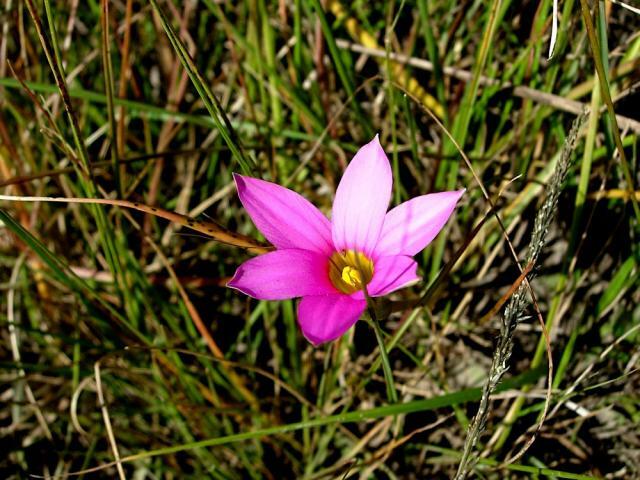 Growing from 12 to 25 cm high, it has 3 or 4 basal and cauline leaves that are narrowly four-grooved and white or pink to magenta flowers with dark veins around an orange-yellow cup. It flowers August to October. Photo from Rod Saunders. 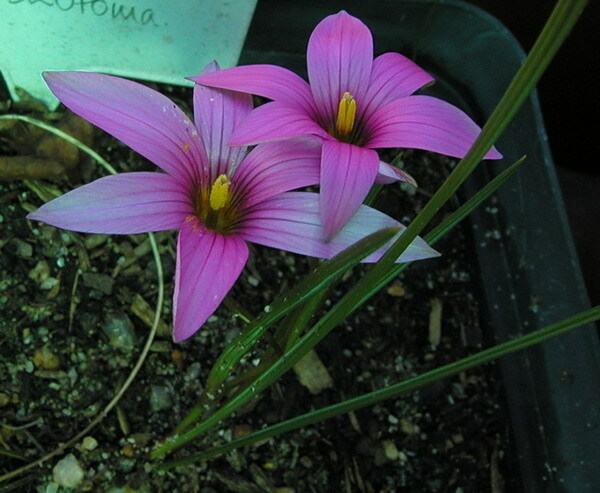 Romulea amoena Schltr. 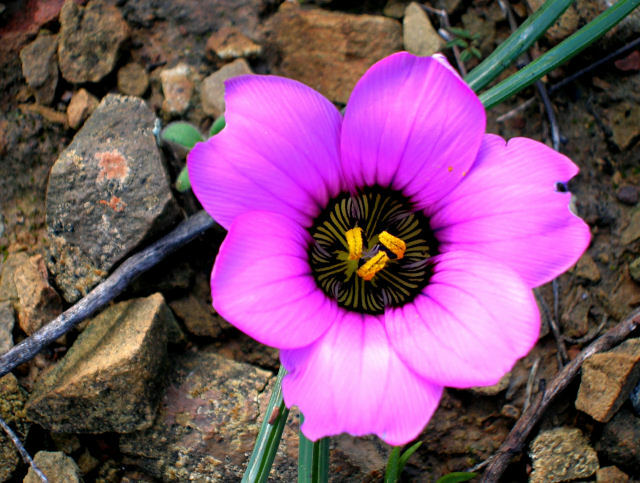 ex Bég was renamed Romulea pudica in Bothalia 41,2: 269–276 (2011). 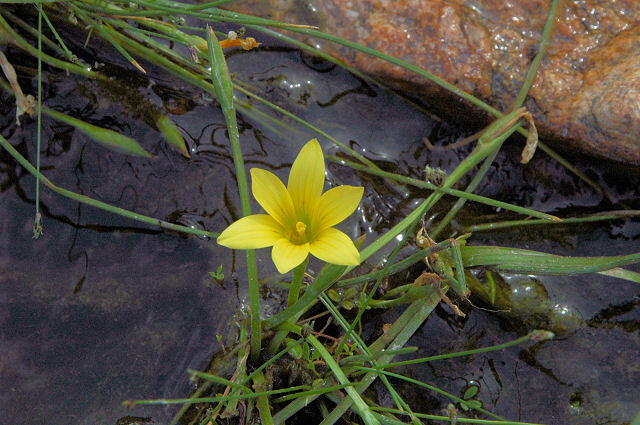 Romulea aquatica G.J.Lewis is found in seasonal pools in the Western Cape. 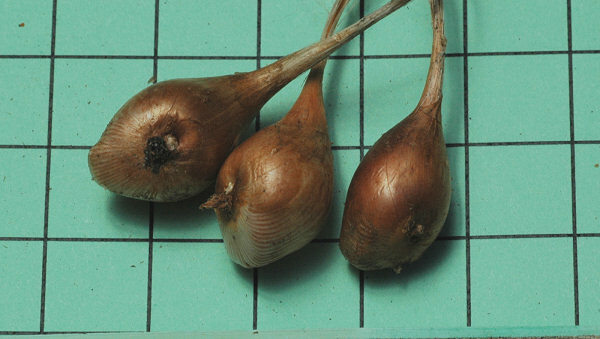 Plants are 20-60 cm high and grow from a corm with an oblique basal ridge. 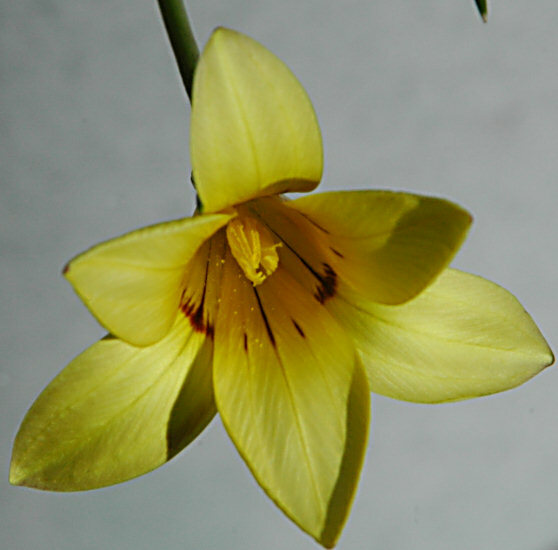 They have two or three leaves and white honey scented flowers with a yellow cup. 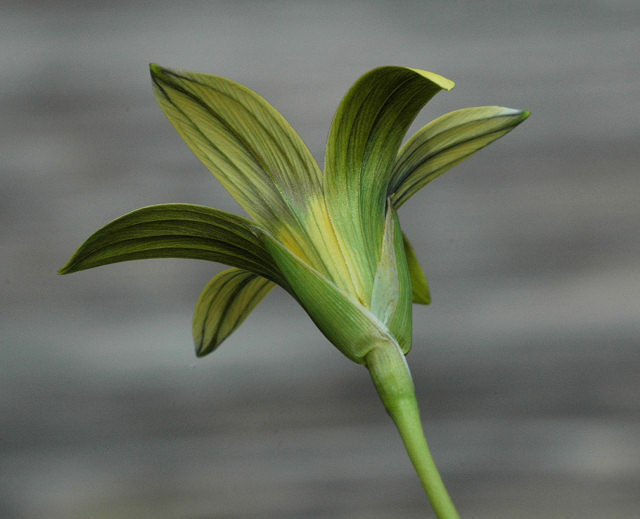 Bracts have narrow membranous margins and inner bracts wide membranous margins. Photographs by David Retief taken near Redelingshuys, Oct 2012. 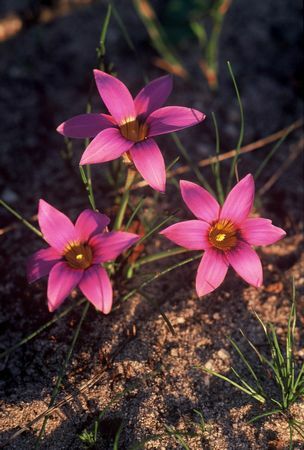 Romulea atrandra G.J.Lewis has a wide distribution from the western Cape to the southeastern Cape and grows in clay soils. Flowers are magenta-rose to pale lilac pink or white, usually with a violet-black blotch or lines on each segment in the throat. 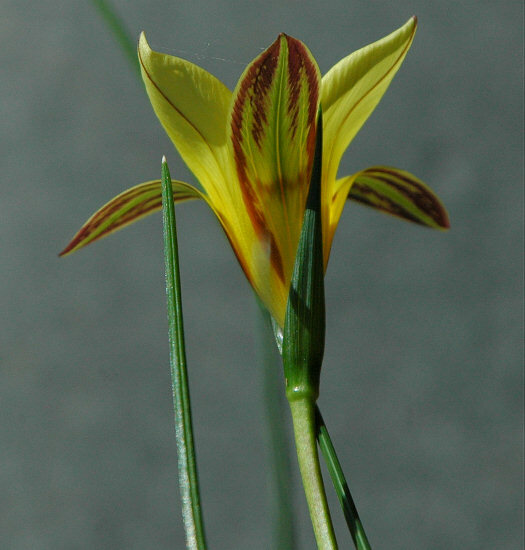 The cup is yellow, sometimes with dark lines and the outer segments are greenish yellow on the backs, with dark lines and feathered veining. 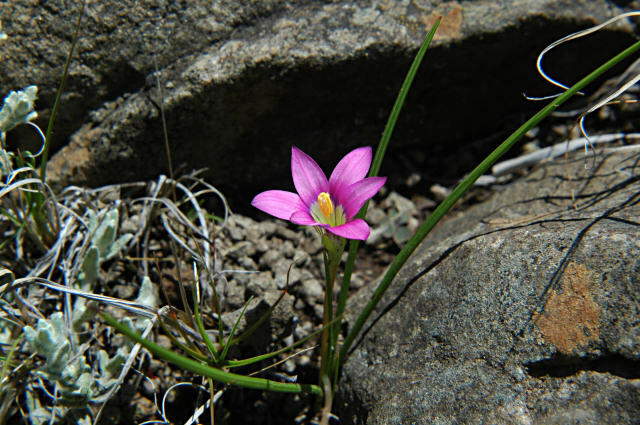 Photos by Lauw de Jager, Alan Horstmann, and the third from Cameron McMaster a habitat shot of this species growing at the Rooiwal Pass in the Roggeveld area of South Africa. The last photo from the book Plants of the Klein Karoo courtesy of Jan and Anne Lise Schutte-Vlok. 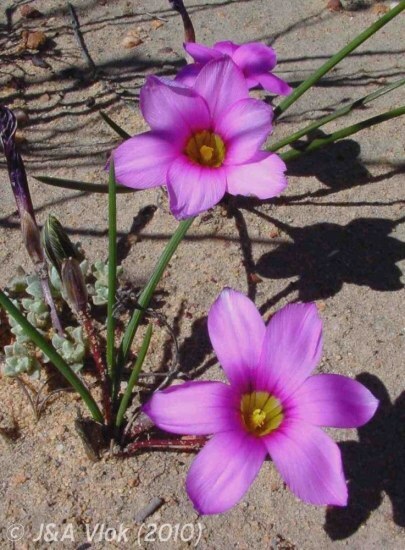 Romulea atrandra var atrandra has leaves that are wider than 1 mm, bracts with brown-streaked or colorless membranous margins and tips and flowers that are 25 to 45 mm long, mostly magenta-rose with a dark blotch on each segment and a yellow cup, usually with dark violet longitudinal lines. 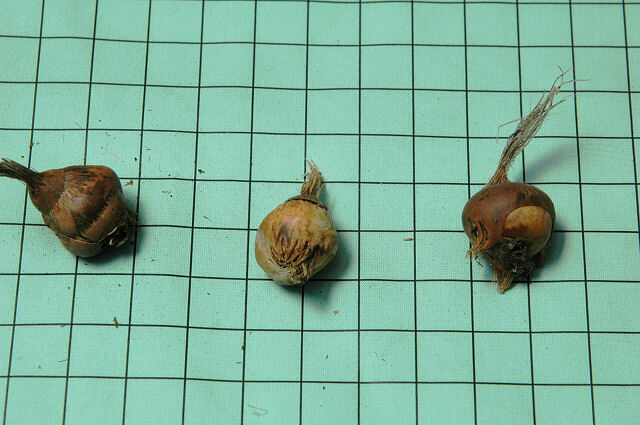 The last photo shows the corms on a 1 cm grid. Photos by Mary Sue Ittner. 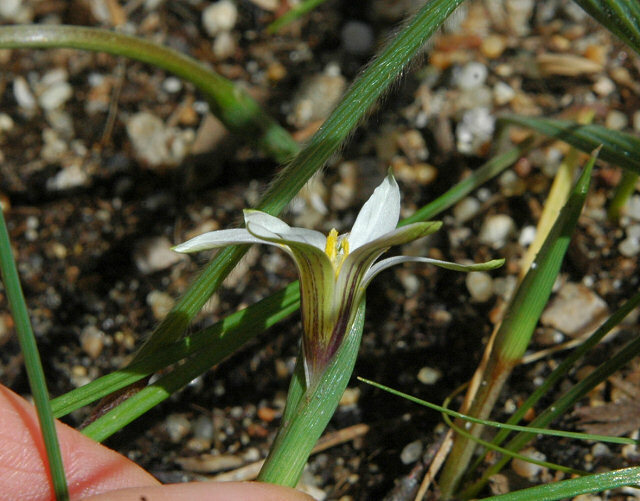 Romulea atrandra G.J.Lewis var esterhuyseniae M.P.de Vos has leaves that are less that 1 mm with narrow grooves and bracts with brown-streaked membranous margins. Flowers are paler magenta to pale lilac or white, with a dark blotch or sometimes dark lines or with a pale transverse zone on each segment. 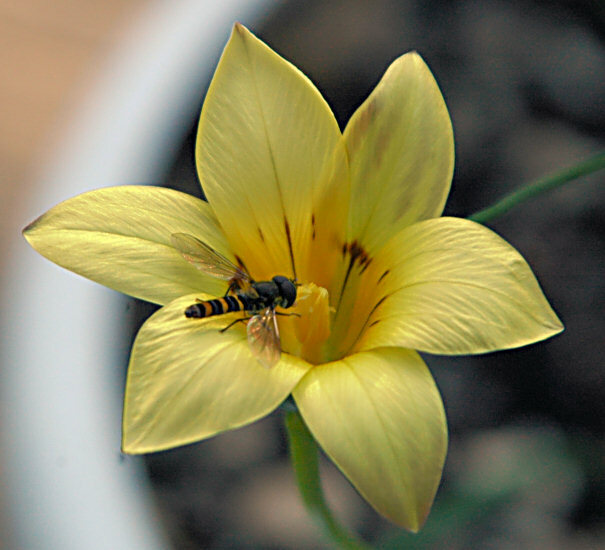 Anthers are mostly yellow. 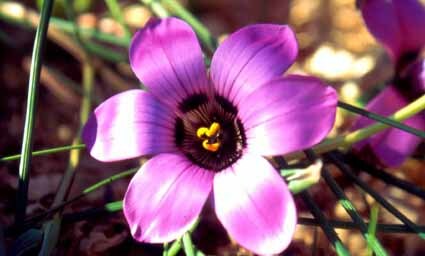 Romulea atrandra G.J.Lewis var lewisiae M.P.de Vos is found in the Karoo and Eastern Cape. 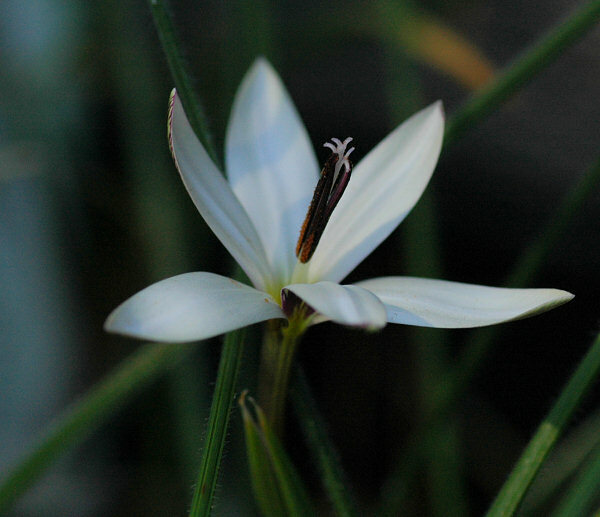 It has pale lilac-pink to white and smaller flowers than some of the other varieties (up to 25 mm long). The outer segments have dark veins on the back. 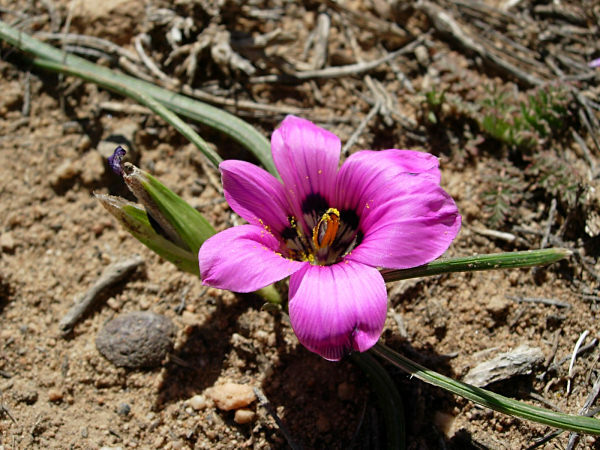 Romulea austinii E.Phillips is found on damp stony flats in the western and south Karoo. 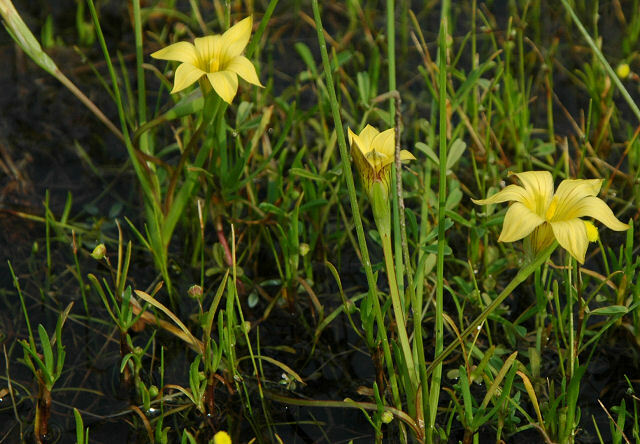 It has honey scented yellow flowers, usually with brown blotches in the throat and grows from 6 to 10 cm high. The first three photos from Mary Sue Ittner. The last photo from the book Plants of the Klein Karoo courtesy of Jan and Anne Lise Schutte-Vlok. 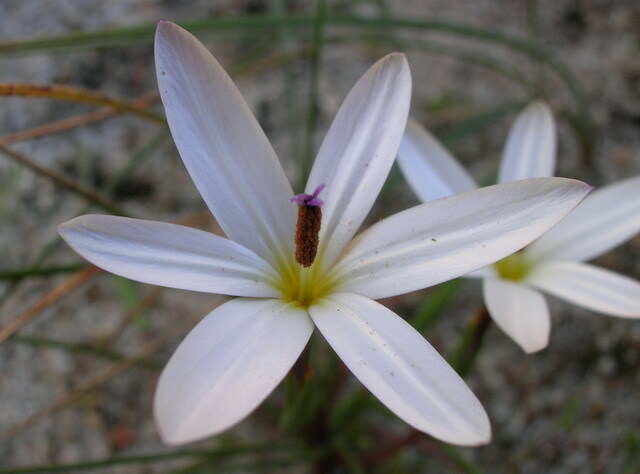 Romulea autumnalis L.Bolus is found in the Eastern Cape growing on grassy flats and low mountain slopes. 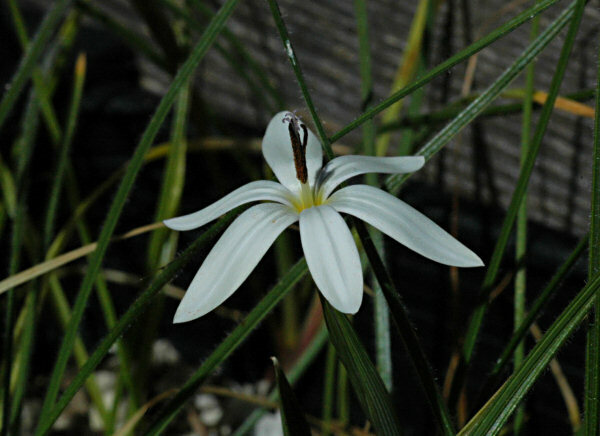 It blooms late summer to autumn. 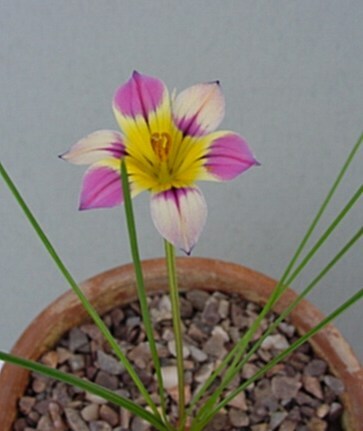 Although the pink flower with a yellow or orange yellow cup looks like a number of other species (R. rosea, R. eximia, R. cruciata), this species differs from the others by having a small ridge at the base of the corm and inner bracts with colorless membranous margins and in the time of bloom. Photos by Cameron McMaster. 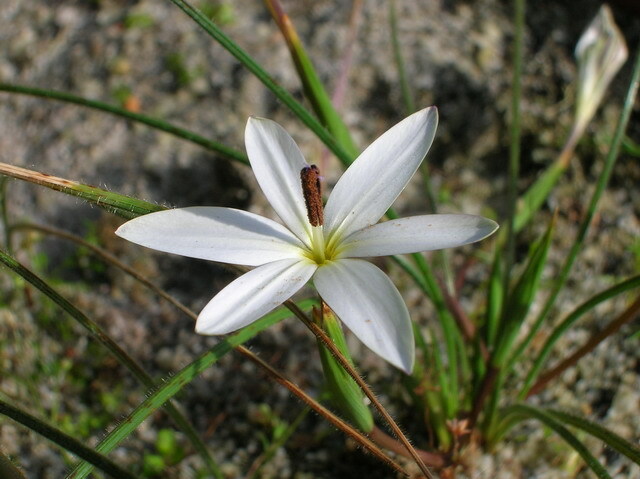 Romulea biflora(Bég.) 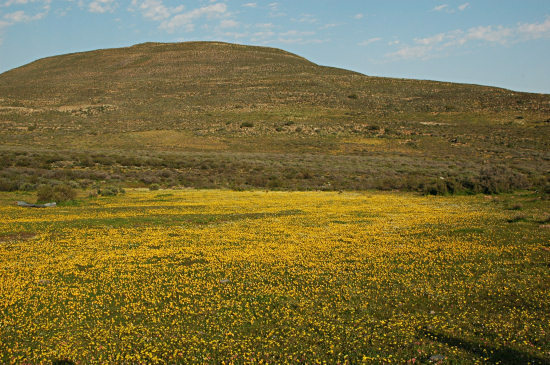 M.P.de Vos is found on clay foothills in the Gifberg and Biedouw valley (Northwest Cape). 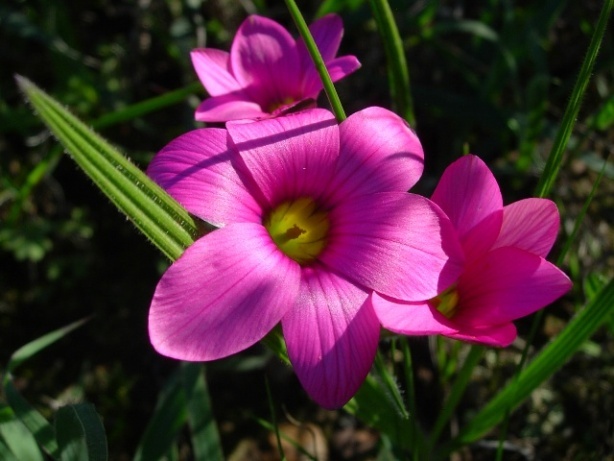 Growing from 10 to 25 cm, it has 2 to 3 filiform basal leaves and pink to rose flowers with purple blotches around a yellow cup. Corms are obliquely flattened towards the base with a pronounced basal ridge forming an almost complete circle. 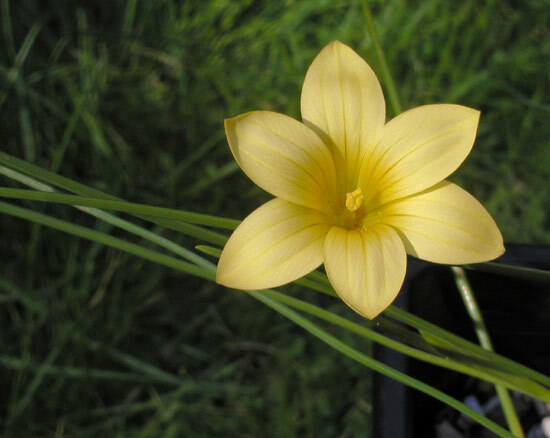 Flowering occurs between July and September. Photos taken by Rachel Saunders on the way to the Biedouw valley. 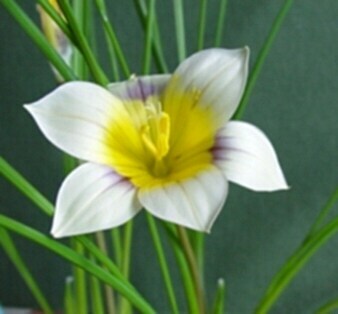 Romulea camerooniana Baker (syn. 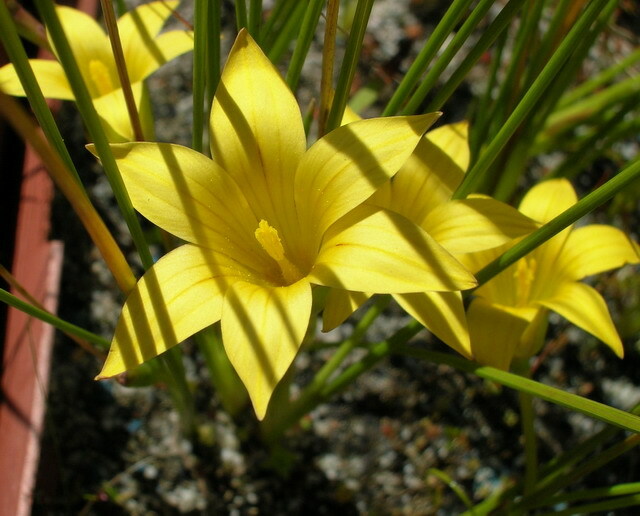 Romulea campanuloides Harms, Romulea thodei Schltr, Romulea thodei Schltr. subsp. gigantea M.P.de Vos) grows in highlands ranging across a huge swath of Africa, stretching from the Drakensberg Mountains in South Africa to Kenya, Sudan, southern Ethiopia, and Cameroon. The form shown here has large flowers, most of them magenta with a yellow center, and white and blue feathering in between. 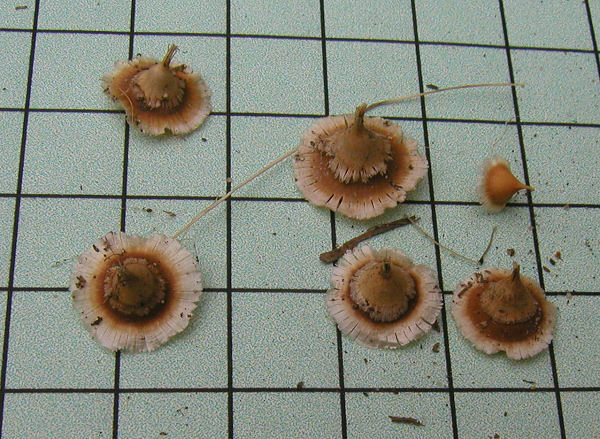 Some other specimens are reportedly smaller than these, and as you can see, some are white. Although this ought to be a summer-growing plant, I have been growing it mistakenly as a winter-grower, and it seems very happy. It blooms in mid- to late spring in California (late April). Photos by Michael Mace. 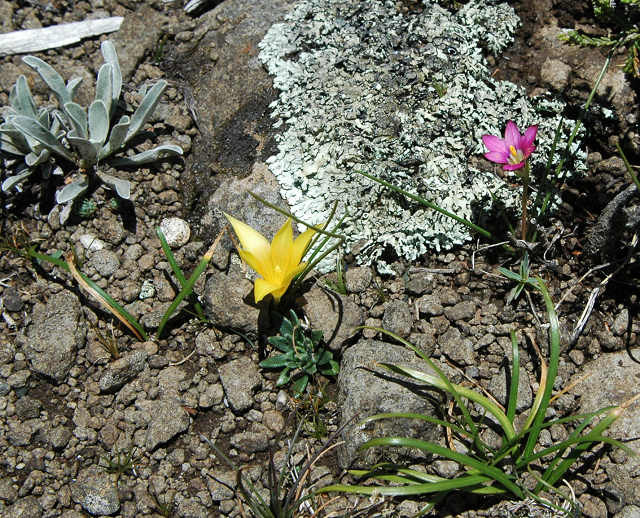 The form once known as Romulea campanuloides var. campanuloides (flowers mostly less than 25 mm.) 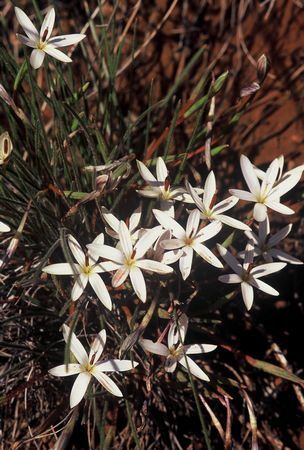 grows in similar habitats to Romulea macowanii , sometimes side by side flowering simultaneously without hybridising. 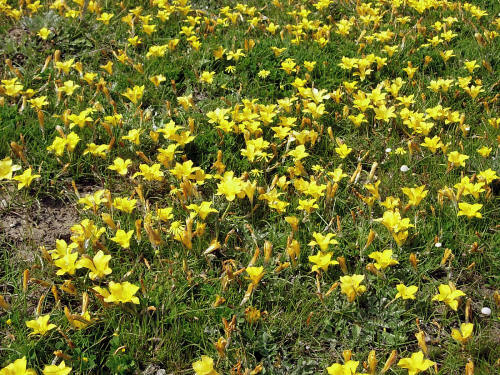 Both prefer high altitude mountain grassland (1000 - 2000 m altitude), often in rocky outcrops and often in moist seepages - so they are adapted to a range of environments. 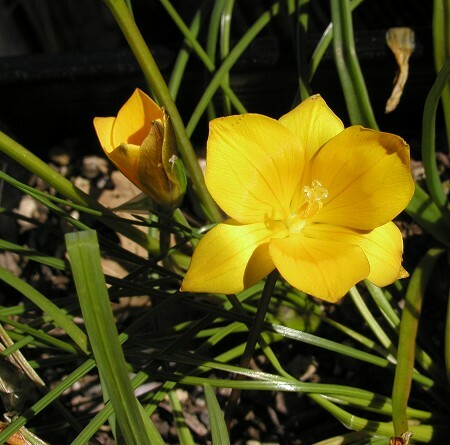 They flower from January but peak flowering seems to be in April, which is autumn in the Southern Hemisphere. 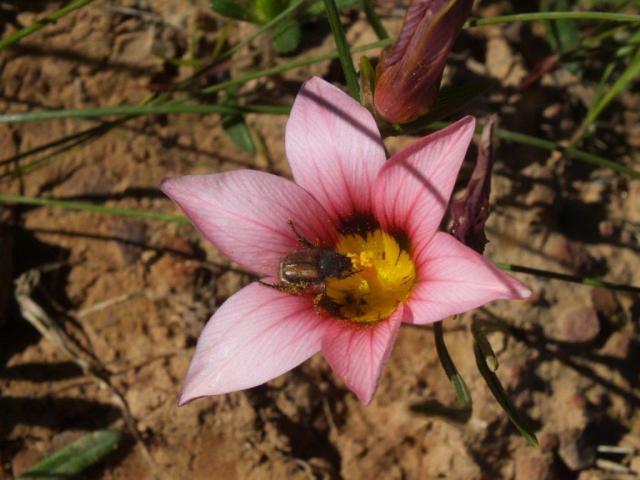 Photos taken of this form (but identified in the field guide as Romulea thodei) at Naude's Nek in the Drakensberg Mountains January 2010. 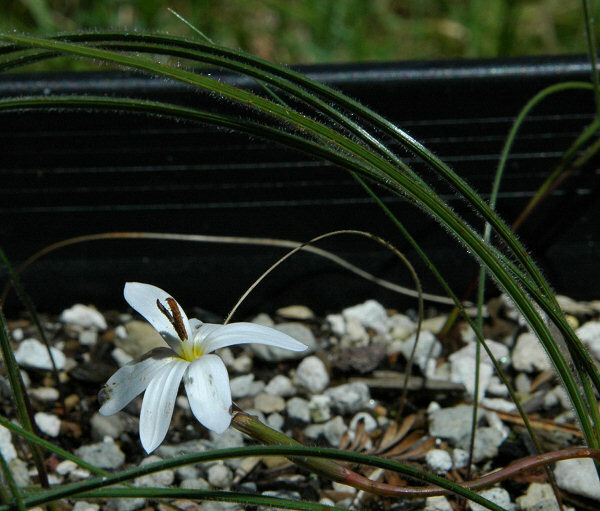 Also growing in this spot and pictured in the last photo was Romulea macowanii. Photos by Bob Rutemoeller and Mary Sue Ittner. 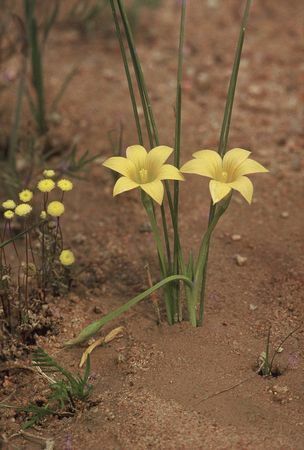 Romulea citrina Baker is found in Namaqualand on sandy or stony ground. Photos by Bob Rutemoeller, Mary Sue Ittner and Alan Horstmann including the final one showing corms with a crescent shaped basal ridge on a 1 cm grid. In spite of this species coming from a very dry area it has done fine being exposed to a lot of rain in winter in coastal northern California. Habitat photos from Rod Saunders and Mary Sue Ittner. The last two taken in Namaqualand September 2006 show it growing in some wet spots. 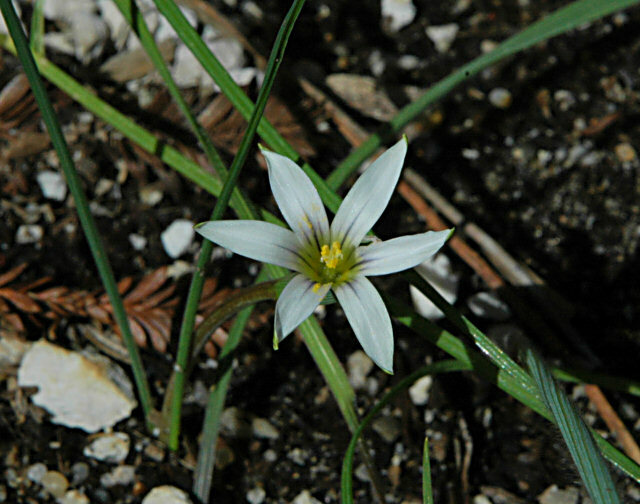 Romulea cruciata (Jacq.) Bég. is found on sandstone and granite slopes and rocks. 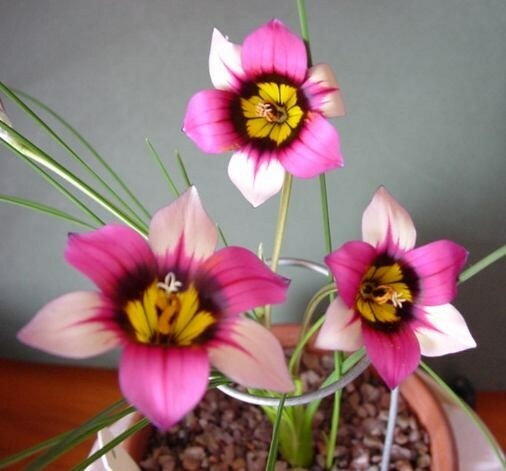 It has magenta to lilac flowers with dark blotches around the dark yellow cup. Photos by Alan Horstmann and Rod Saunders. The last photo from the book Plants of the Klein Karoo courtesy of Jan and Anne Lise Schutte-Vlok. 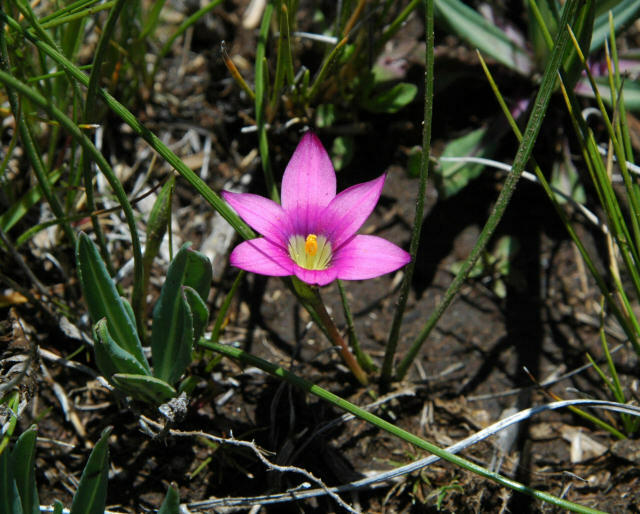 Romulea dichotoma (Thunb.) 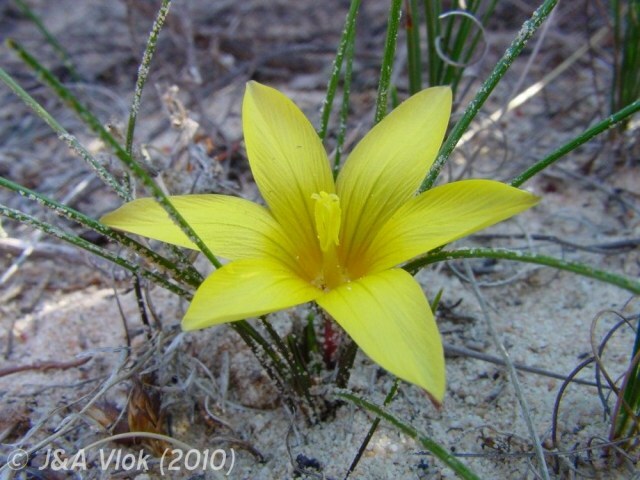 Baker grows on sandy flats and slopes in southern Cape areas and flowers in spring. 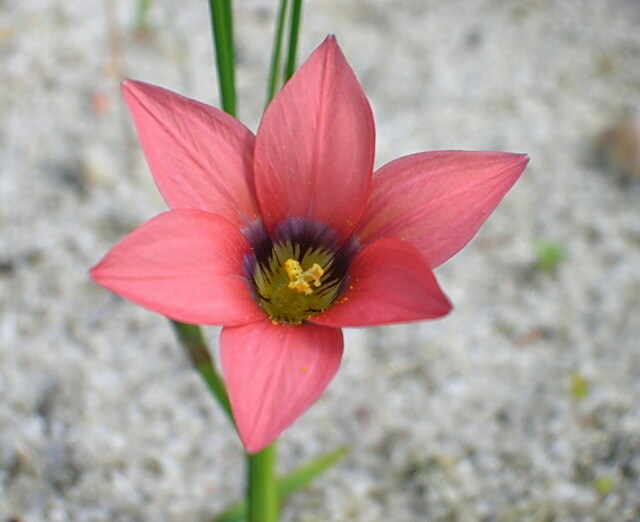 It has pink flower with a yellowish cup. The first photo was taken by Cameron McMaster in the Overberg and the second by Bob Rutemoeller of plants grown by Gordon Summerfield. 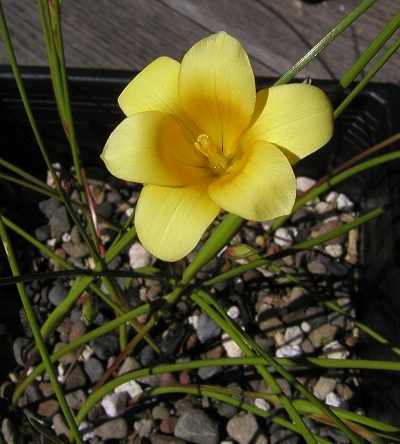 Romulea discifera J.C.Manning & Goldblatt has very unusual corms that are disc shaped with a wide rim of fibers. 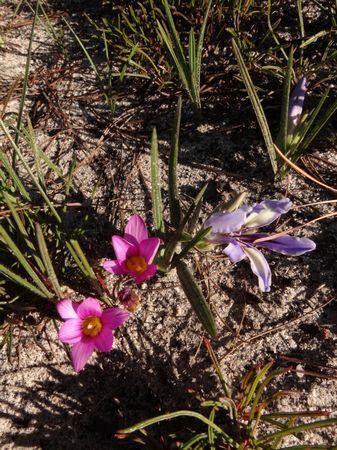 It grows on sandy flats in the northwest Cape and blooms in winter. 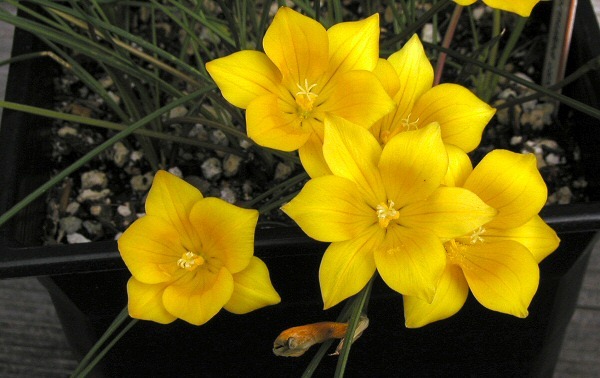 Photos by Rod Saunders of the yellow flowers with darker markings and a darker yellow cup and by Bob Rutemoeller and Mary Sue Ittner of the flowers and also corms on a 1 cm grid. 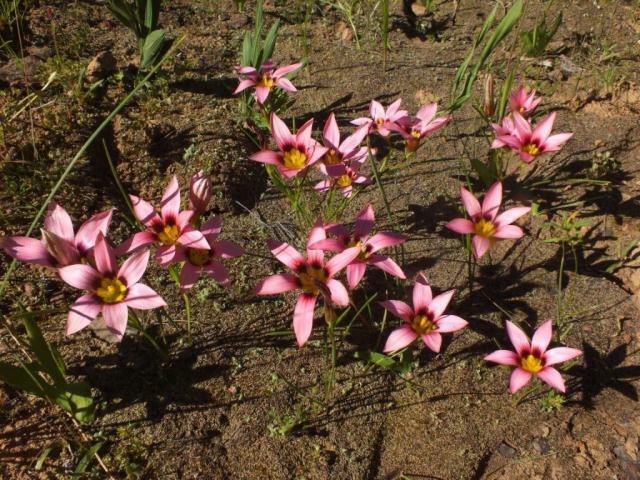 Romulea diversiformis M.P.de Vos grows in moist or waterlogged dolerite and clay in the winter rainfall area of South Africa. 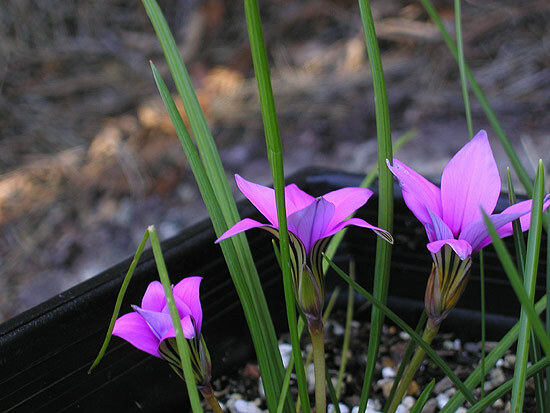 Photos by Bob Rutemoeller and Mary Sue Ittner of plants that grow quite well in coastal northern California. 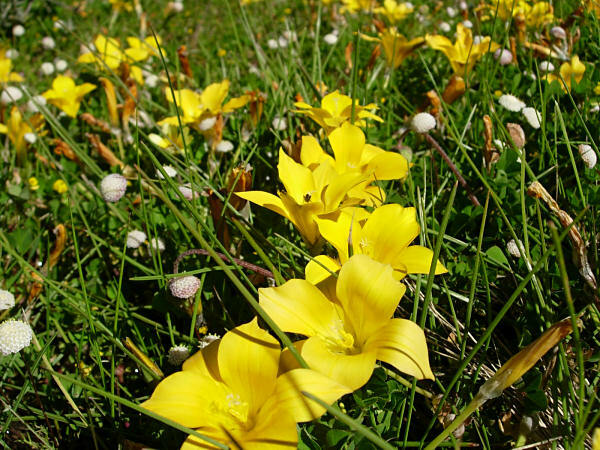 They are one of the earlier species to bloom each winter, usually in February in the northern hemisphere. 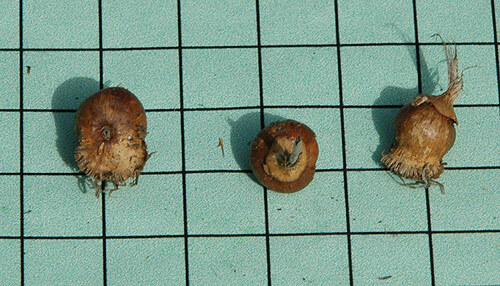 The last photo from Mary Sue Ittner shows the corms on a 1 cm grid. 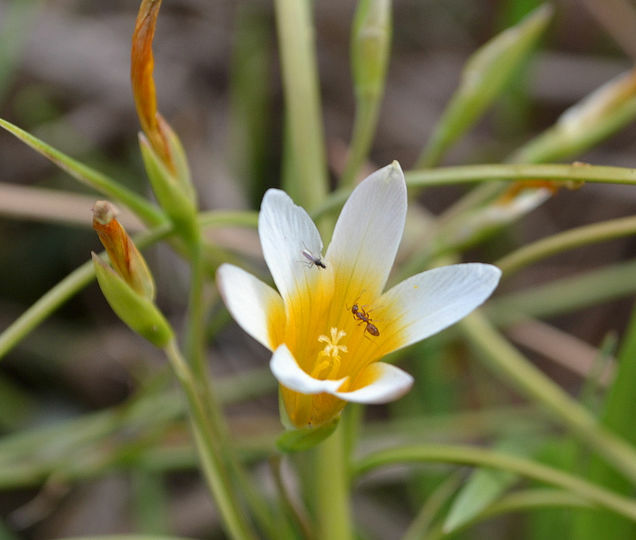 Photos taken in habitat in the Roggeveld (Komsberg) by Cameron McMaster and Mary Sue Ittner. 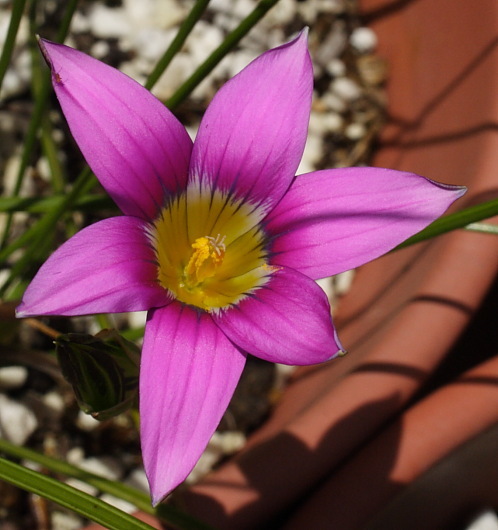 Romulea diversiformis x Romulea komsbergensis hybrids Audrey Cain was surprised to see the flower below grown from wild collected seed of Romulea diversiformis and believes it to be a hybrid between the two species mentioned above. 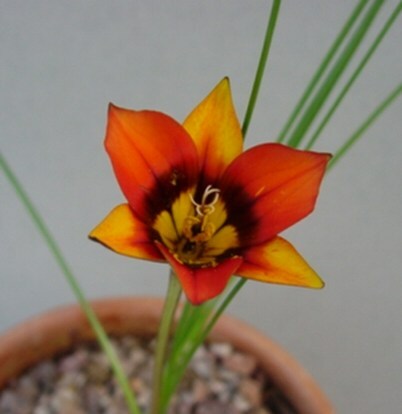 The first one certainly looks more like Romulea komsbergensis. She self pollinated the cross and the three pictures below illustrate the results. All photos by Audrey Cain.